A conductor, organ soloist and accompanist, Huw Williams works throughout the UK and is also the Musical Director of Monmouth and Stroud Choral Societies. He is the Sub-Organist at Her Majesty’s Chapel Royal, St James’s Palace, London where his predecessors include Tallis, Byrd, Purcell and Handel. He teaches at Cambridge University and Eton College. 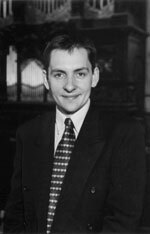 Born in Swansea, and a graduate of Christ’s College, Cambridge and the Royal Academy of Music, he first became Assistant Organist at Hereford Cathedral. In 1998 he moved to St Paul’s Cathedral where, as the principal organist, he played for all the major recordings and broadcasts, such as the Queen’s Golden Jubilee Service, and worked daily with the world famous choir. In 2008 he became Director of Music at the Church of the Redeemer, near Philadelphia. An experienced performer as recording artist, conductor and accompanist he has made recordings as accompanist with The Sixteen and with St Paul’s and Hereford Cathedrals and broadcast live on television and radio as both director and accompanist.